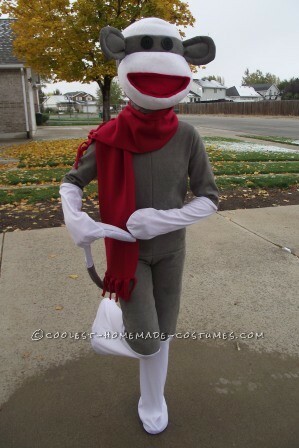 Cool Homemade Sock Monkey Costume That'll Knock Your Socks Off! 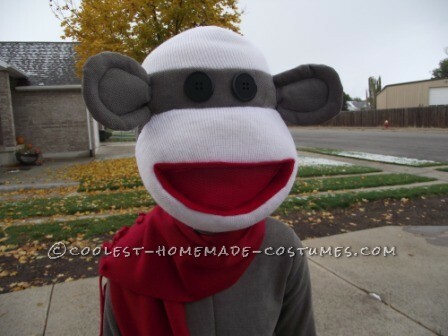 Cool Homemade Sock Monkey Costume That’ll Knock Your Socks Off! This year my almost 12 year old daughter ambitiously announced that she was going to make a costume – a Sock Monkey costume to be exact. Not wanting to squash her ambitions I enthusiastically agreed that it would be a great idea. I knew this was a task bigger than both of us because her sewing skills are limited to the basics and I prefer to only do extremely basic projects. This was a big project with great potential to fail given that she wanted the real thing that you see in the car commercials on TV. My biggest fear was disappointing her while wasting a whole lot of money in the process. I also saw it as a great opportunity to work on a project together. It was a challenge from beginning to end but the result is something that I am extremely proud of. I had no idea I was capable of creating a costume like this. I was unable to find a suitable pattern for the body so I created my own out of a pair of pants and long sleeved shirt that I deconstructed. I found the perfect material for the body, arms and legs and got to work. The body took a bit of trial and error but with a few modifications along the way we were pleased with the result. The most important part of the costume for my daughter was that her head be fully covered. How do you make a costume head? I certainly didn’t know. I had a stroke of genius at the local home improvement store when I saw a display of spiders that had been made with insulating foam sealant. I bought a can and came home with my fingers crossed that I could make my idea work. I found a bowl that was the shape I needed, lined wit with saran wrap and filled it with the foam. I let it dry and cure overnight and then popped it out of the bowl. I made two of these and then I carved one to fit like a helmet and I carved the other with an opening to fit in front of her face as the mouth of the monkey. I glued the two pieces together with more foam and then covered the whole thing with fabric to create the look of a Sock Monkey head. The opening in front of her face which became the mouth of the monkey was covered in multiple layers of red netting as this was the space for her to see and breathe through. To finish it off we added a red fleece scarf to make the connection between the head and body appear seamless and we pinned the base of the legs to the bottoms of flip flops to help avoid the appearance of feet. Our total cost was around $30. I’m amazed that we pulled it off so well.